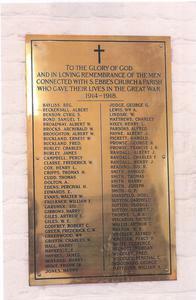 Rectangular brass plaque mounted on wall. The plaque is surrounded by black linear border with Latin cross at the top centre. Inscribed inscription followed by names in two columns. Carved lettering in Roman caps.